The origin of the apple is uncertain, as historically there were many similar apples with different names. It is claimed that it originally grew at Parham Park near Arundel. Golden Pippin was first recorded as a variety in 1629 by Parkinson, though it was well known by late 1600s. The Golden Pippin apple was widely grown in gardens and markets in the eighteenth century. In 1830 one commentator wrote: “This variety is too well known to need description as a small golden-coloured dessert apple of distinguished excellence” (quoted in Taylor). By the 1890s, it was thought of as too small, though it was used in the first apple breeding programmes. It is currently cultivated as part of Brighton Permaculture Trust’s National Collection in Stanmer Park, Brighton. You can see a Golden Pippin apple tree (planted 2009) in Home Farm Orchard, Stanmer Park ( map). The Golden Pippin has an intense, brisk taste with a fruity lemon tang. When cooked, it keeps its shape with a sweet, rich taste. The small fruit were poached whole to make sweetmeats, pippin, jelly, tarts and cider. 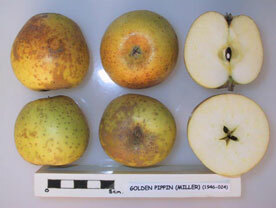 The fruit is gold coloured with many bold russet dots and some russet at the base. The apple is small in size and round-conical in shape with a short thick stalk and pale yellow flesh. Basin large, broad, shallow; slightly ribbed. Eye open. Cavity broad, shallow, russet lined. Fruit can be picked in early October and stored until January. The Golden Pippin tree is moderately vigorous. The Golden Pippin tree is resistant to scab.